objectName If you want to access the object later then you must do this with this name. 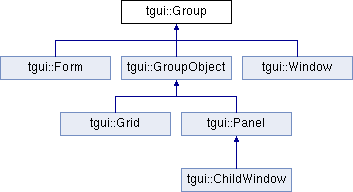 Implemented in tgui::Grid, tgui::Panel, tgui::Window, and tgui::Form. const sf::String & newObjectName = ""
oldObject A pointer to the old object. newObjectName If you want to access the object later then you must do this with this name. oldObjectName The name that was given to the object when it was added to the group. newObjectName If you want to access the copied object later then you must do this with this name. This function will return NULL when an unknown object name was passed. object The object that has to be focused. Returns a pointer to an earlier created object. objectName The name that was given to the object when it was added to the group. Make sure that the name belongs to the object you are trying to get. Behaviour is undefined when e.g. calling this function to get a picture but when passing a name that was given to a button. Returns a list of the names of all the objects. Returns a list of all the objects. Loads a form from a file. The objects will be loaded and added to the group. Note that even when this function fails, some objects might have been loaded already. Places an object behind all other objects. Places an object before all other objects. If there are multiple objects with the same name then only the first matching object will be removed. The next object will be focused. object The object that has to be unfocused. Update the internal clock to make animation possible. The internal font, used by all objects by default. If not changed then this is the default SFML font.